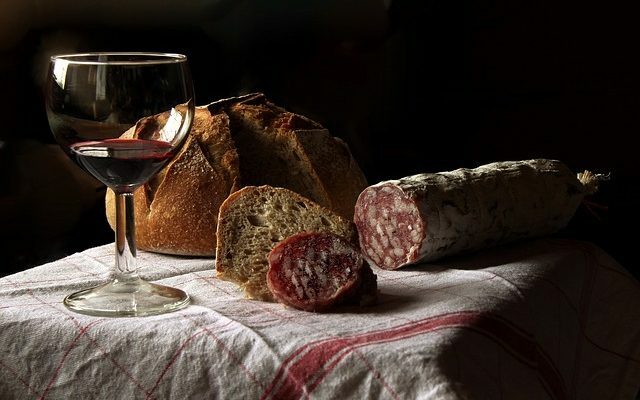 Wine is such a rich drink that sometimes, the wisest thing to do is to surrender to its strength and choose a simple meal to go with the choice of the night. Sometimes though, the meal you have on the menu is so complex and distinct that it calls for a more humble, simple wine to be taken out. If you are having some co-workers or extended family over for an afternoon meetup and serve light snacks sparkling or light bottles are what you should offer. When you have people over for dinner, you should always do it like the French does. Start with a slightly heavier white to go with a seafood appetizer, a softer and sweeter red with lamb and a strong red with a spicy meat meal to keep up the game. Some people believe they have to finish the evening with the same color of wine with which they began, but this only limits the variety of tastes you can match during a course of a meal. The rule of red wine with red meat, white with white meat is not as strict as many people think. It depends a lot on the way the meat is cooked, as well as the sauce. For example, a bottle of white won’t go that well with a chicken lost in tomato sauce. A light red would make a mushroom-creme sauced chicken taste much better. The tuna fish is not considered seafood in the equation of wine matching, so a sweet red is the one to go with in that case. With cheese, always go with white or a sweet red. If you want to cook meat with wine, use a light one. Pepper goes well with mature, rich red wines. Basil and a light Chardonnay can make any day feel like a summer day. Don’t forget to let your wine breathe, and breathe yourself. We are a little zesty and just a little bit tart, we have a full bouquet of wit and charm. With a passion and knowledge of wine, and a love of food we are here to celebrate a full bodied experience.